There is much curiosity around homeschooling, especially around what we do every day. Non-homeschoolers and other homeschoolers alike always love to get a sneak-peek into a homeschooler’s day. So for the curious, here, in very broad strokes, is what happens in our home every day. We are working on getting the kids to go to bed earlier and therefore waking earlier. Our aim (we aim low) is to have them out of bed at 8.30 am. Previously it was 9.30 and all previous attempts to move it have failed to-date. But we are still trying. 🙂 Part of the problem is that we have so much fun with the whole family together at night, that there is little incentive for anyone to want to go to bed. TC enjoys spending time with his kids so much he can’t bear to part with them too! Also, we keep telling ourselves that this flexibility with bedtime is one of the perks of homeschooling. But the latest push is part of the whole plan to go maidless. You see, right now when I need to use the car, I send TC to work and leave the kids, fast asleep, at home with our helper. But she will be leaving in two weeks’ time, so the plan is for them all to come along for the ride. 🙂 The occassional breakfast at McDonald’s should be incentive enough to wake up earlier on those days. We start “school” proper at 10 am with Bible Reading. We read from the Narrated Bible, which is the NIV arranged chronologically, we sing hymns and we recite Bible verses. More details here. For Math the two older ones are doing mainly the local curriculum, while Nathalie is doing Right Start Math. Alethea and Timothy are more or less independent with this, with my helping them only at the start of each topic to clarify it briefly with them. They don’t have much problem with math, thankfully. 🙂 We are using Shaping Maths (we use the Math Builder since it has ANSWERS while the workbooks don’t), FAN Maths (various titles) and On Sponge for some more “exciting” stuff. This last one is really good and I highly recommend it! It started out tough, but halfway through the P3 book last year, Alethea suddenly declared that she really liked it! Copywork is pre-prepared. I tried to wing it once upon a time, looking for good passages in whatever we were reading, but it failed miserably! Alethea is copying passages of Scripture, Timothy and Nathalie are writing from a variety of sources, Bible verses, good books, poems, fables, idioms, quotable quotes from famous people, etc. They all finish at various times during the morning, Alethea taking the longest with her work, of course. Which she dislikes TREMENDOUSLY and frets about sometimes. Sigh … I tease her about wanting to compare and tell her she should be insisting that Baby Daniel be required to do seatwork also! I guess it really is our nature to compare. The time in the afternoon is very flexible. We have people over, we go out for lunch with the grandparents, we go on fieldtrips. When we are home, the children read from an assigned booklist (I really should find time to post that soon) which cover various subjects – history, geography, science, or just great chapter books. Every evening, I insist my bookworms go out for a spot of exercise. They are reluctant some days, when they are really into a book or some elaborate play, but are always the better for it. And I am the better for the hour without them hovering over me and asking questions incessantly! Ha ha ha! It is really safe for the kids to go downstairs on their own to play in our current codominium, because there is a basement carpark so the ground floor is free for running about. There is also a security guard at the gate of a very small condominium. But in the new place, it is surface parking and very little room to run. So we are planning to head to the beach where possible. We school 4 days a week, leaving one for outings. Once a week, my parents take the kids out for lunch. They usually just eat around the Pasir Ris/Tampines area, do a bit of grocery shopping then the kids get dropped off back home. The children really look forward to this! Once a fortnight, Alethea’s homeschool friend Sophia comes over for a spot of “homemaking” lessons. So far they have baked cinammon rolls, sewed patchwork pillows and made twirly tutus for their younger sisters. 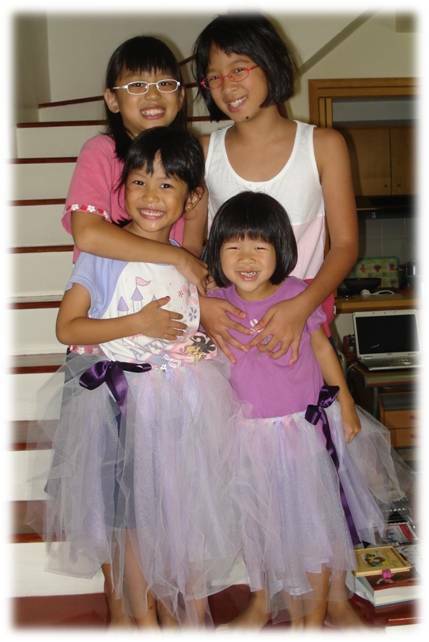 Sophia and Alethea with their little sisters Anna and Nathalie in their new No-Sew Tutus! 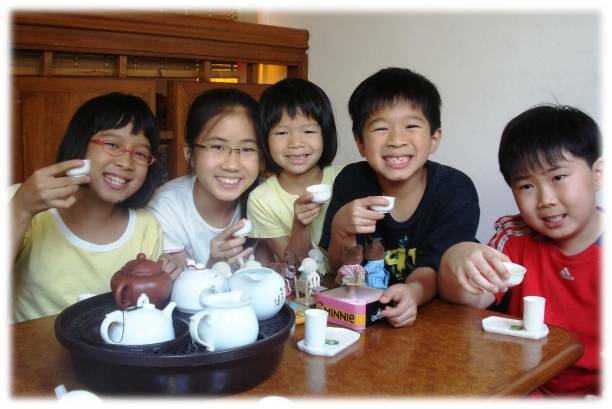 On the other alternate weeks, we meet with another homeschool family, Sook Neo and her kids, to do the Young Aborist Programme together and to study (okay, maybe something less formal) Singapore History. Savouring tea at Tea Chapter during Chinese New Year. Once in a while, we meet with the larger homeschool group for outings like the recent visit to the Maghain Aboth Synagogue. Alethea and Timothy have Badminton lessons weekly in Pasir Ris with a group of other homeschooled kids (anybody else want to join us? ), and on Saturdays Thea, Tim and Nat head to GIM Sports for gymnastics.